Congress leader and Thiruvananthapuram candidate Shashi Tharoor, who is recovering at a hospital after a freak accident, had an unexpected visitor early Tuesday. 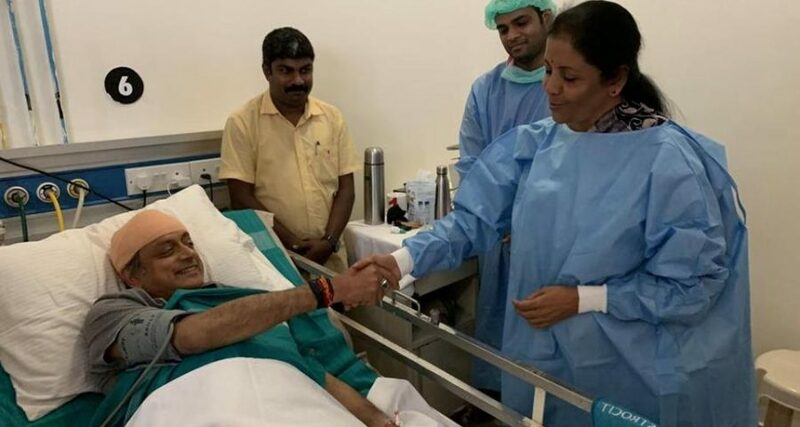 Defence Minister Nirmala Sitharaman, on a campaign trip to Kerala, dropped in to see the MP who was injured during a religious ceremony on Monday. “Touched by the gesture of @nsitharaman, who dropped by today morning to visit me in the hospital, amid her hectic electioneering in Kerala. Civility is a rare virtue in Indian politics – great to see her practice it by example!”, Tharoor tweeted from his hospital bed. The Congress leader also received a call from Left Democratic Front (LDF) leader C Divakaran who had a piece of advice for him. As part of Thulabharam — a religious ritual where offering equivalent to one’s weight is made to the deity — the Congress candidate was sitting on weighing scales at a temple in Thiruvananthapuram when it collapsed injuring his head. The Thiruvananthapuram MP was rushed to a general hospital where he received six stitches on his head. Doctors said his condition was stable but he was advised rest. Tharoor is seeking a third term from Thiruvananthapuram, which goes to polls on April 23. He is locked in a keen contest with BJP candidate and former Mizoram Governor Kummanam Rajasekharan.